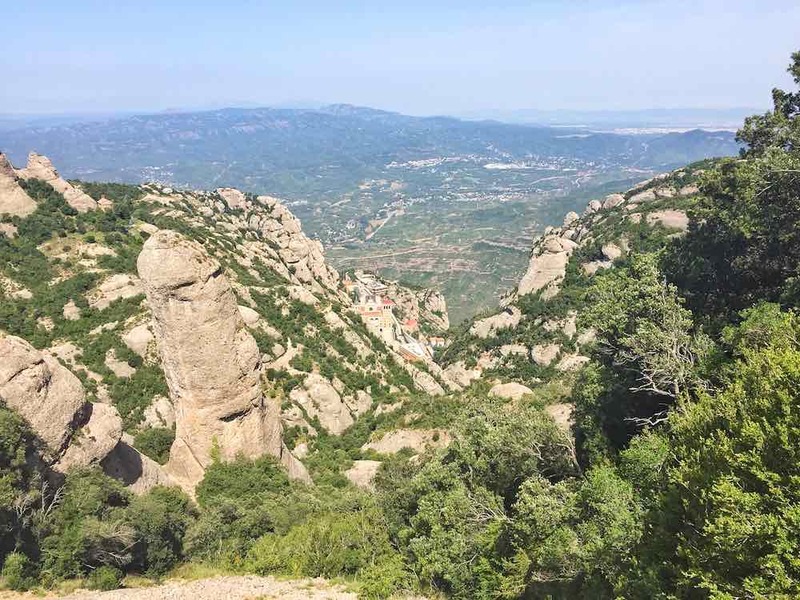 There are lots of great hikes in Barcelona but hiking in Montserrat is one of, if not the best hiking trail in Barcelona. It’s also an awesome day trip from Barcelona. A multi-peaked mountain range reaching 1,236m at its highest summit, there are various ways to explore these mountains near Barcelona. 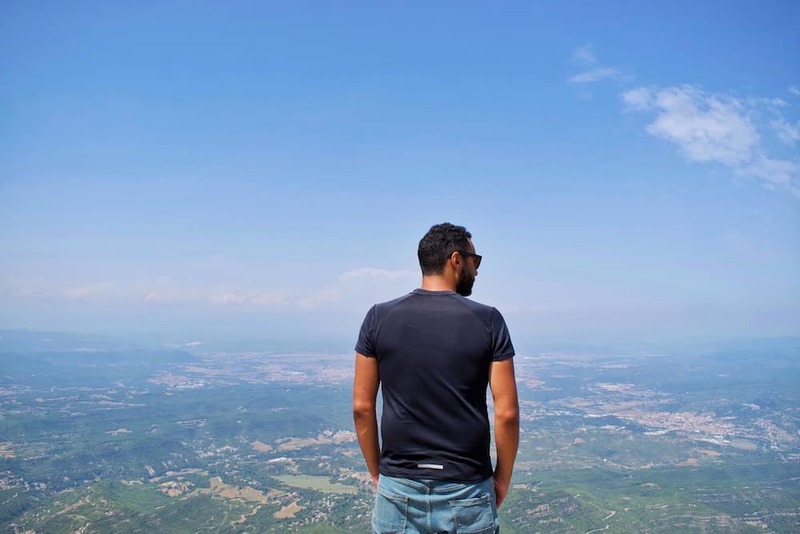 But if you have an adventurous streak like us, the best way is to take a Montserrat Barcelona hike all the way up the mountain from the base to summit. 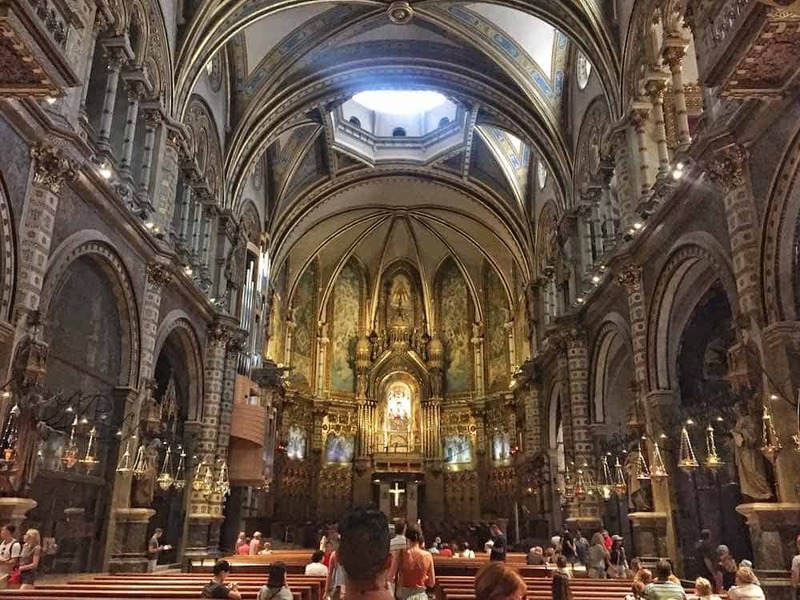 A visit to Montserrat is a great alternative Barcelona itinerary item. 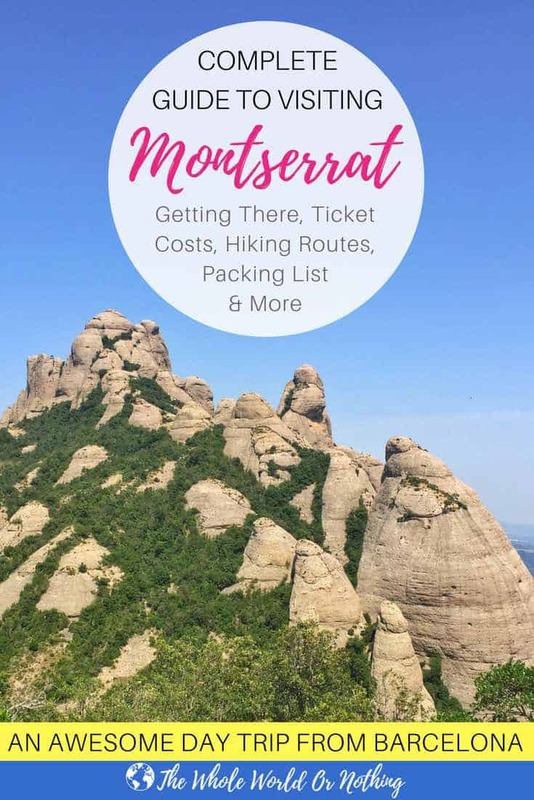 In this complete guide to hiking in Montserrat, we will tell you how to get the train from Barcelona to Montserrat including costs, show you the Montserrat hiking trails up the mountain, detail how to visit Montserrat Monastery, give you a Montserrat hiking map for the top of the mountain and give you a packing list for your Montserrat Barcelona hike. 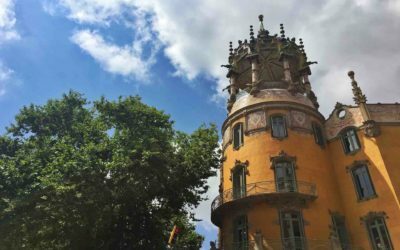 As well as a little of the history and some details about the Monserrat cable car and funicular. You can take a bus to Montserrat but unless you are driving, the quickest and most direct way of getting to Montserrat is by train. The journey from Barcelona train station Plaça espanya to Montserrat takes just over an hour and you can purchase tickets on the day. However because of the different optional routes up and down the mountain the ticket options can be a little confusing. The first Barcelona to Montserrat train is 8:36 and then runs every hour until 16:36. Coming back from Montserrat, the last train to Barcelona leaves at 18:41 and prior to that runs every hour from 9:41. Please note there are other trains that run outside of these times on some days. For example the day we choose to visit Montserrat there were trains running up to 22:00 back to Barcelona. So do check Barcelona to Montserrat train times on your specific day of travel, either at the stations or at the tourist information office on Montserrat mountain. Your starting point for getting to Montserrat from Barcelona is Plaça espanya train station. This is on line 1, line 3 and line 8 of the Barcelona metro system so it is easy to get to. But it is also huge with lots of different levels. So be sure to allow plenty of time to find the right part of the train station you need to be in for the platform and to buy train tickets to Montserrat. 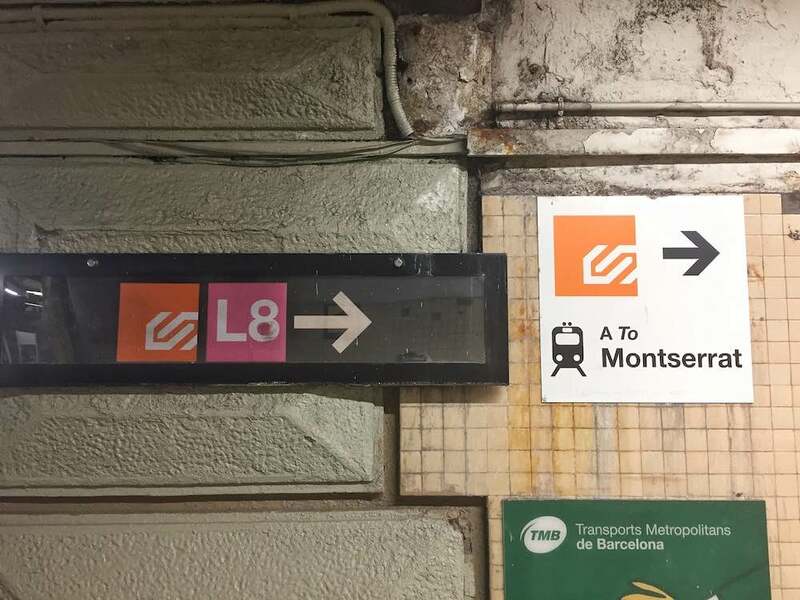 Depending on where you are coming from in Barcelona, when you get into Plaça espanya train station you need to either follow the green signs for ‘R5 Manresa’ train or the orange signs for Montserrat as pictured below. This will take you to the platform and the place you need to buy tickets for the train from Barcelona to Montserrat. You then have five options. Let’s break it down because this is where the confusing bit comes in when you visit Montserrat. 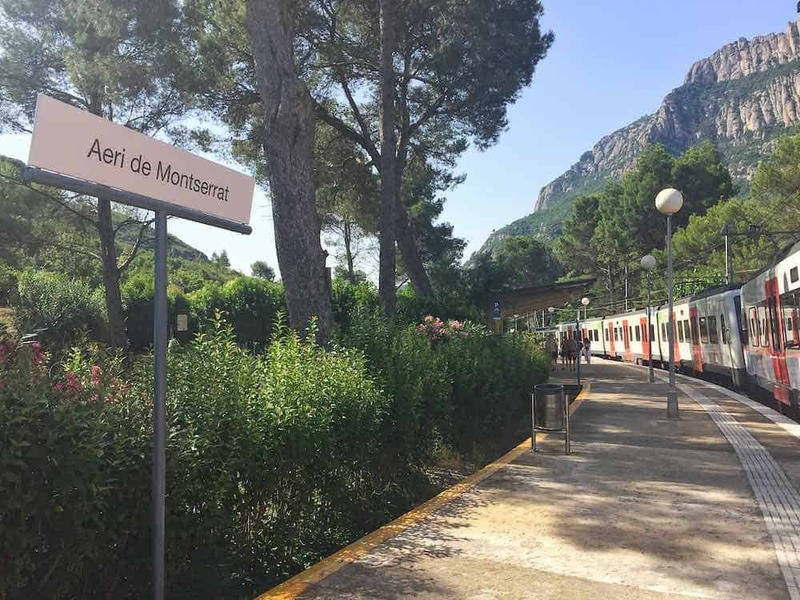 Option one, you can buy Montserrat combined tickets that include return train tickets and access to the mountain via the cremallera mountain train, or Montserrat rack railway as it is also called. 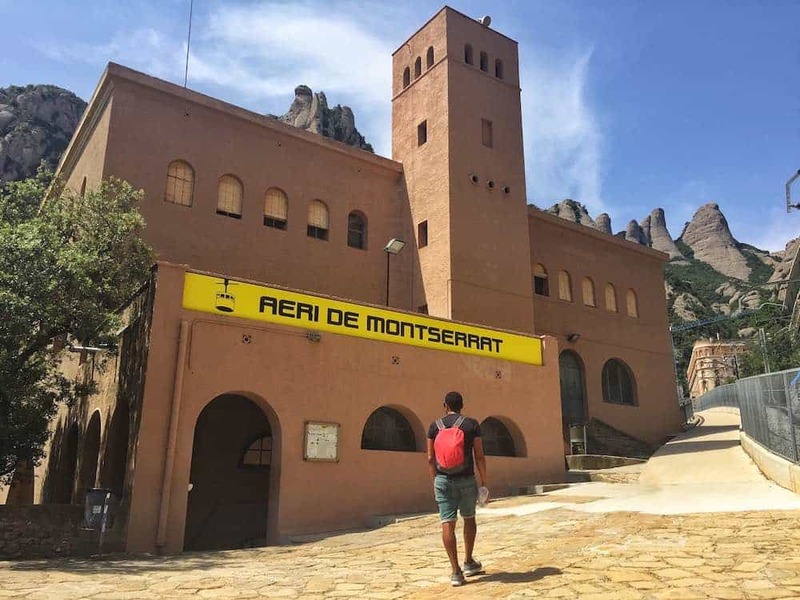 Option two, you can buy Montserrat combined tickets that include return train tickets and access to the mountain via the Montserrat cable car, or Aeri de Montserrat in Spanish. Both of these options for visiting Montserrat cost €22 each. 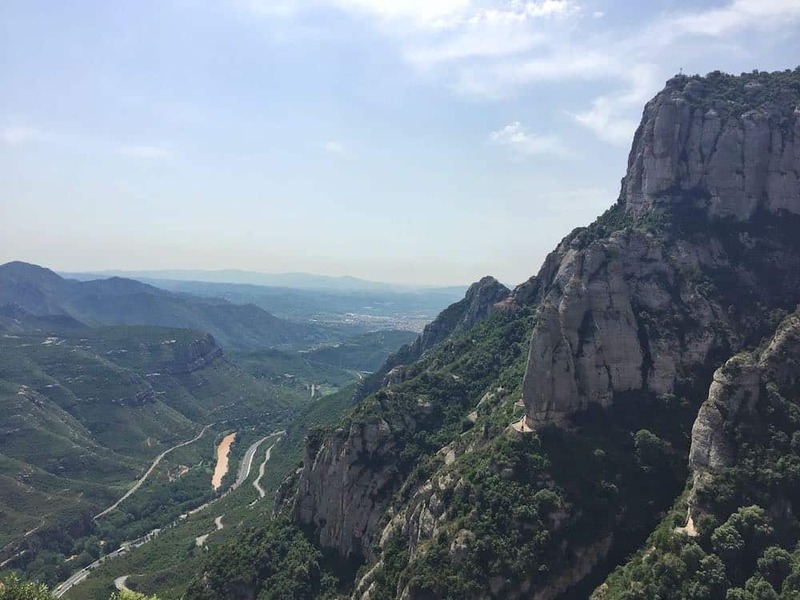 Your third option is to buy Montserrat combined tickets that include either option one or two, plus two funicular rides to different parts of Montserrat mountain once you are up there, including the highest summit, Sant Jeroni. A funicular ride is a mountain train that goes up steep slopes. Just a note though, it doesn’t go all the way to the top, there is still an element of hiking involved. The cost of these Montserrat combined tickets is €35.30 each. The fourth option is something called the ToT Montserrat ticket, which literally means the whole of Montserrat. Included in this ticket to visit Montserrat is everything mentioned in option three, plus entry to the Montserrat museum (€7 separately) and a restaurant buffet lunch (€15 separately). The cost of a ToT Montserrat ticket is €53.85. 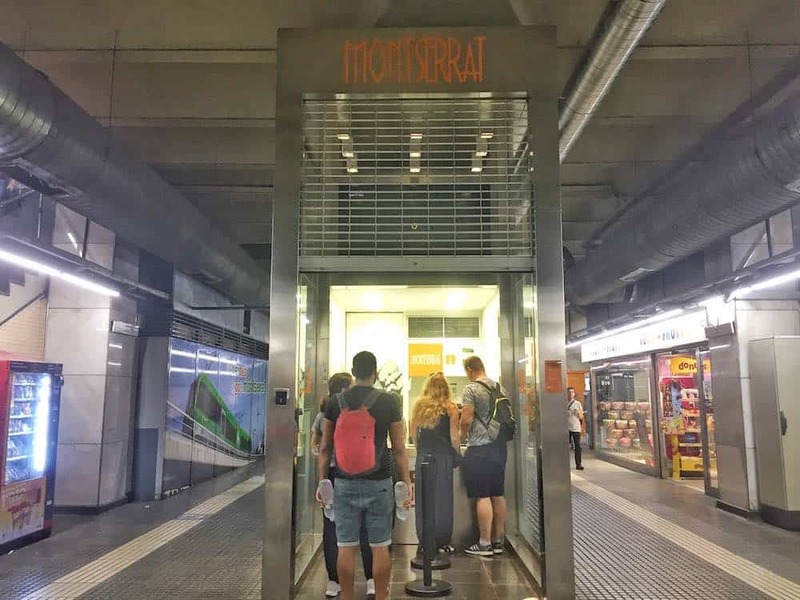 Please note that hen you are buying a Montserrat combined ticket or ToT Montserrat ticket, depending on whether you are taking the Montserrat cable car or Montserrat rack railway, they are purchased from two different booths near the Plaça espanya to montserrat platform. Then you have option number five, which is not only the most adventurous but also the cheapest. Great for those wishing to experience Barcelona on a budget. We think this is the best way to visit Montserrat. You still take the train from Barcelona to Montserrat, but that is where the assistance ends. Once you get off the train, your way up the mountain is via one of the Montserrat hiking trails. There are two different routes which we’ll go into next. But first you have to purchase your ticket which is much harder than it should be. 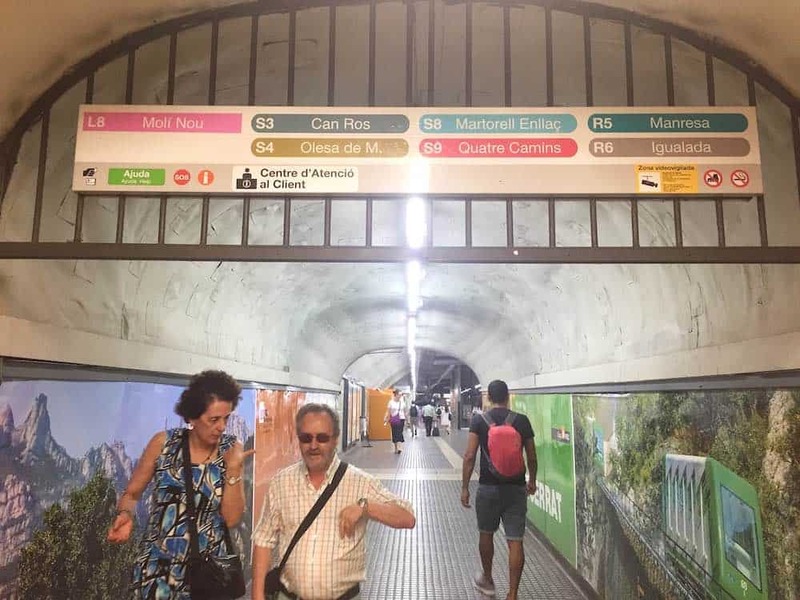 Thankfully there was a train station attendant present on the Plaça Espanya to Montserrat platform to help, but just in case there isn’t, here’s what you need to do. 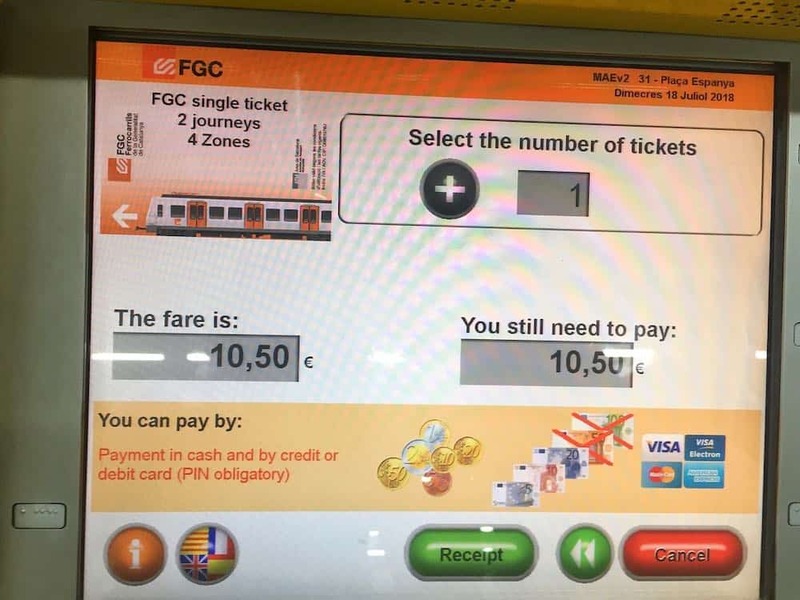 Change the ticket machine language to English, then choose ‘FGC single ticket’ and ‘FGC single ticket 2 Journeys’ (this will give you a return). Then choose ‘Zone 4’ and however many number of tickets you need. The fare is €10.50 each and you can pay by cash or card. Then you need to hop on the R5 train to Manresa. This went from platform 3 the day we went, but obviously please double check on your day of travel. All prices are correct at the time of writing. 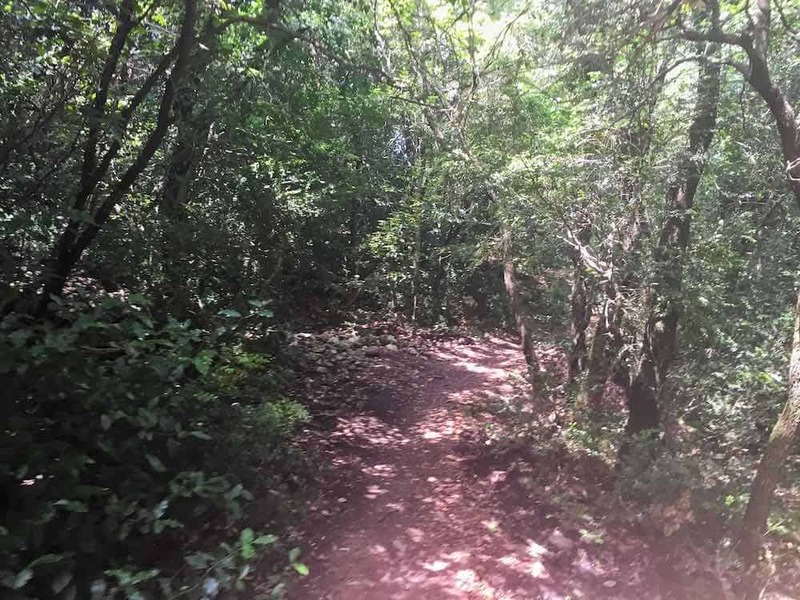 We’re huge fans of independent adventures and hiking so I will go now go into detail on how we went up the mountain via the Montserrat hiking trails. 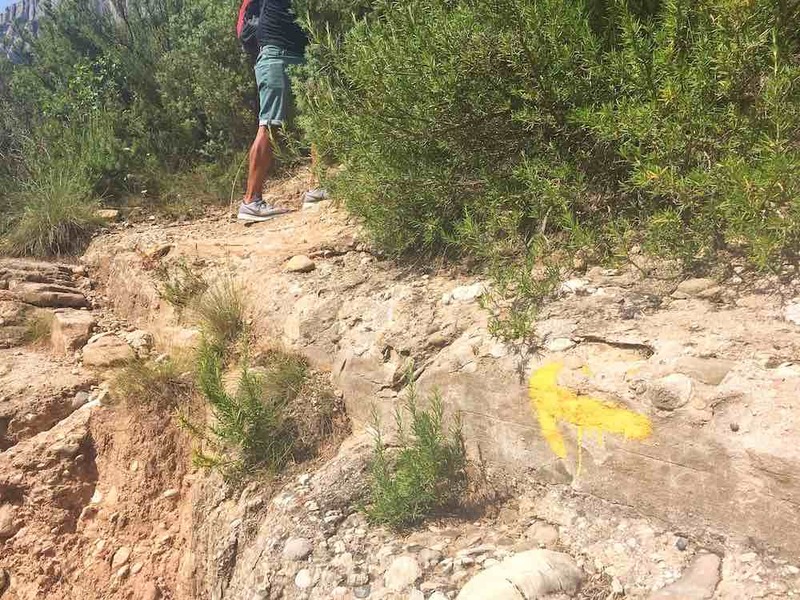 There are two different routes to the Montserrat mountain hike. We took one up and the other back down, but you can go up and down the same way if you prefer. The first of the Montserrat hiking trails up the mountain starts at the same stop for the Montserrat cable car and is called Montserrat de Aeri. From here you need to make your way to the Montserrat cable car station, cross the car park and over the bridge straight ahead to the main road. From the main road turn right. Be careful, the road is fast and busy. There is a small path down the side of the barrier which you have to walk down for around 5 minutes. You need to look out for the start of the trail, as pictured below on the opposite side of the road. This Montserrat Barcelona hike will take you around 1 hour and 30 minutes from the Montserrat car cable station to reach Montserrat Monastery. The other route for the Montserrat Barcelona hike starts from the last stop on the Montserrat to Barcelona train line, in the village of Monistrol. It is called Monistrol de Montserrat. 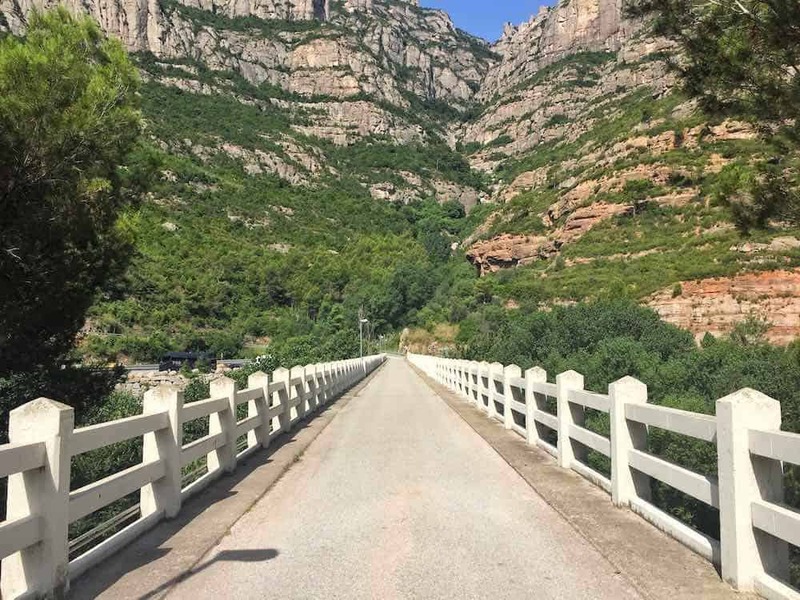 To get to the start of the Montserrat hiking trail you will first need to cross the bridge over the River El Llobregat into the village of Monistrol de Montserrat. 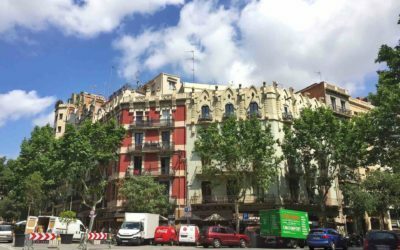 Then walk up Passeig de la Canaleta, turning left at the end onto Carrer de les Escoles and then left again up the steps along Carrer de la Font. At the top of those steps cross the road and you will see the start of the Montserrat Barcelona hike in front of you, be careful it’s a fast road on a bend. The walk from Monistrol de Montserrat train station will take around 15 minutes. From here it will take you around 1 hour 30 minutes to reach Montserrat Monastery. 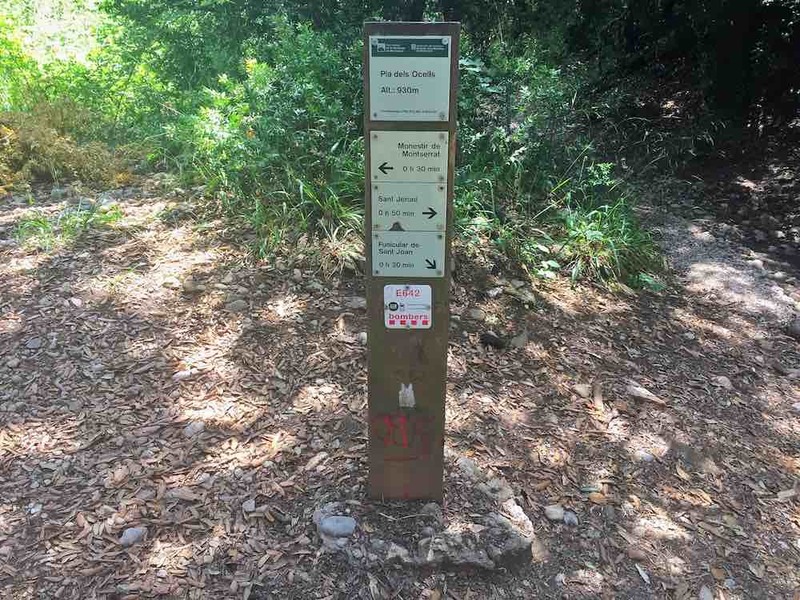 The start of this Montserrat hiking trail is a little trickier to locate and you may find you need to ask for directions. We went up from Montserrat de Aeri and back down this way which I think is easier. In which case follow these directions in reverse. There is no difference in the timing of each of the two hikes, although coming back down is slightly quicker at around 1 hour 15 mins. 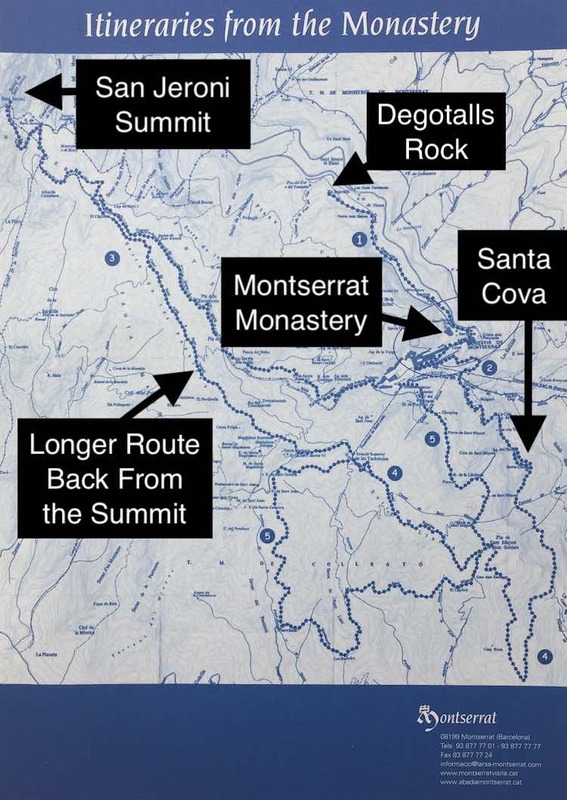 Once on them, both of these Montserrat hiking trails are easy enough to navigate. There are a few alternative paths that go off in different directions at times but so far as we could tell they all converge again and as long as you are continuing to go up, you can’t really go wrong. 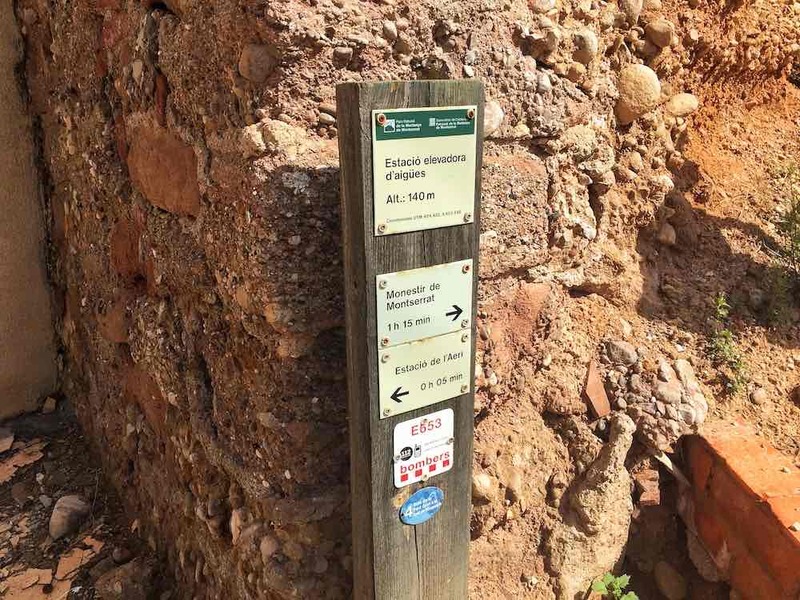 There are also some faded markers to follow on parts of the trail, but if you are worried about getting lost, download the Barcelona region map on the Maps.Me app. Then simply put in ‘Monestir de Montserrat’ which is Spanish for Montserrat Monastery and follow that. This is also useful to follow for knowing when you are nearing the train stop you want to get off at. You will pass it on your way up, but on your way back down look out for where the trail splits leading to either Aeri de Montserrat or Monistrol de Montserrat starting points. 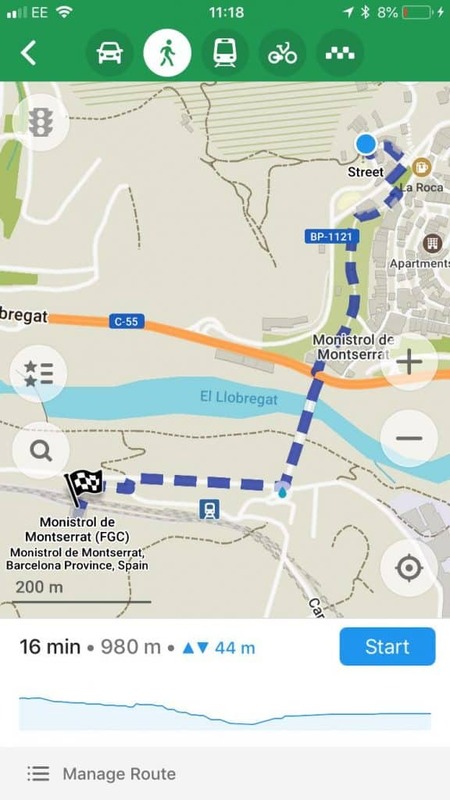 Confusingly, both routes are marked as Monistrol de Montserrat. But it is the one with ‘Per la drecera des ¾’ underneath that will take you down into the the Village of Monistrol. 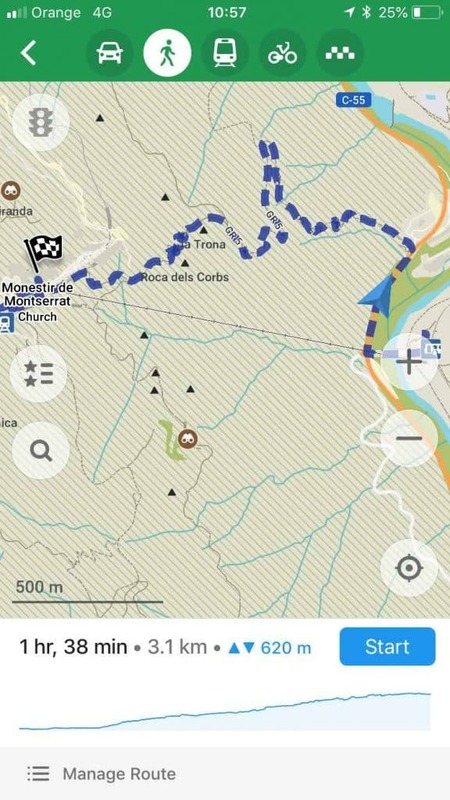 Both of these Montserrat hiking trails are difficult and at times a little technically challenging. Although there is a path of sorts, it is very uneven and requires climbing up and over large rocks in some places. 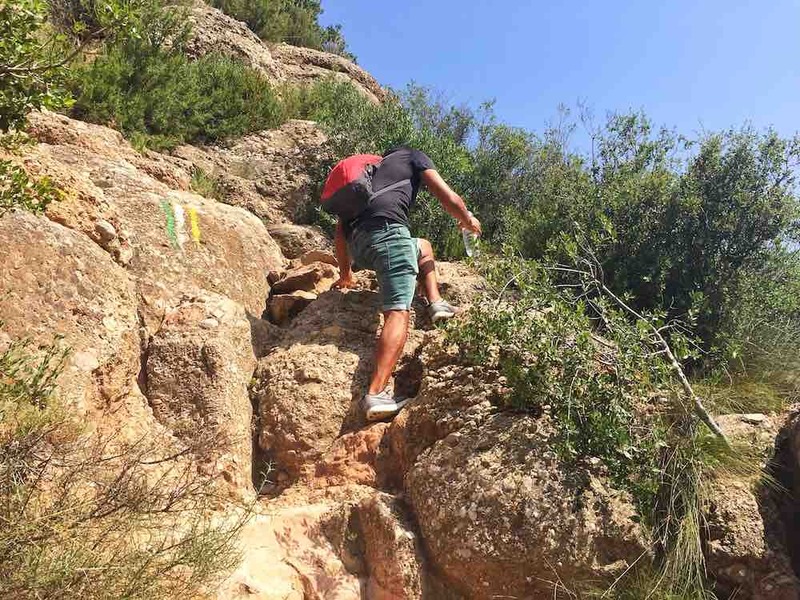 Especially on the way down, the Montserrat trails can be slippery and there are also lots of loose ‘prime ankle twister’ rocks so be sure to wear sturdy footwear. It also gets very hot because large parts of the hiking in Montserrat is completely exposed. We thoroughly enjoyed our Montserrat Barcelona hike and think it is the best way of getting to Montserrat. 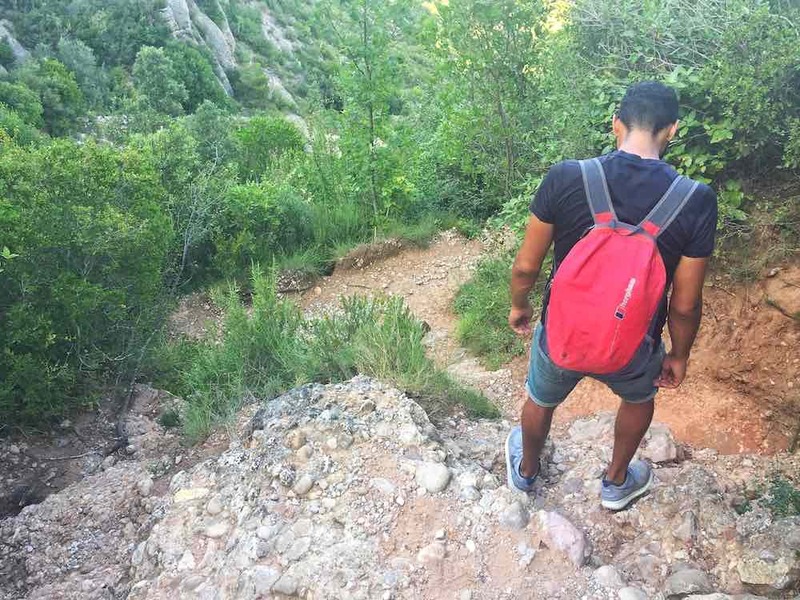 There are also many other Montserrat hiking trails on the mountain itself and once we reached the Montserrat Monastery and had a look around there, we continued up to the mountain summit, Sant Jeroni. But before we get into that here’s some information on getting to the Montserrat Monastery via the Montserrat cable car or Montserrat rack railway if you don’t want to hike up. The Montserrat Monastery cable car, or Aeri de Montserrat as it’s known locally, takes you on a steep 5 minute journey over the Llobregat Valley and River up to the Montserrat Monastery. It started running in 1930 and travels at a speed of 5 metres a second up a 45% gradient. While we didn’t do it because we took one of the Montserrat hiking trails, it is said to be pretty exhilarating, watching the ground drop away from you. To take the Montserrat cable car you need to make sure that you get off at the correct stop. When you near, it is the first of the two Barcelona to Montserrat train stops and is called Montserrat de Aeri. The Montserrat Monastery cable car station is then right there. Once you reach the top there is a 3 minute walk up a slope and some steps to visit Montserrat Monastery and the main area with the tourism office, restaurants and toilets. During opening times, the Montserrat cable car runs every 15 mins but has different operating times depending on the time of year. From March to October it runs from 9:40 – 19:00. And from November to February runs from 10:10 – 17:45 on weekdays and 9:40 – 18:15 on weekends. Individual prices for Aeri de Montserrat tickets are €7 single and €11 for a return. At peak times there can be long queues for the Montserrat cable cars and each ride has a maximum capacity of 35 people so be sure to allow yourself enough time to catch your Montserrat to Barcelona train, if you are coming back down this way. Please note if you are a disabled traveller or have limited mobility, the Montserrat cable car is unfortunately not adapted, you would need to take the Montserrat rack railway option. 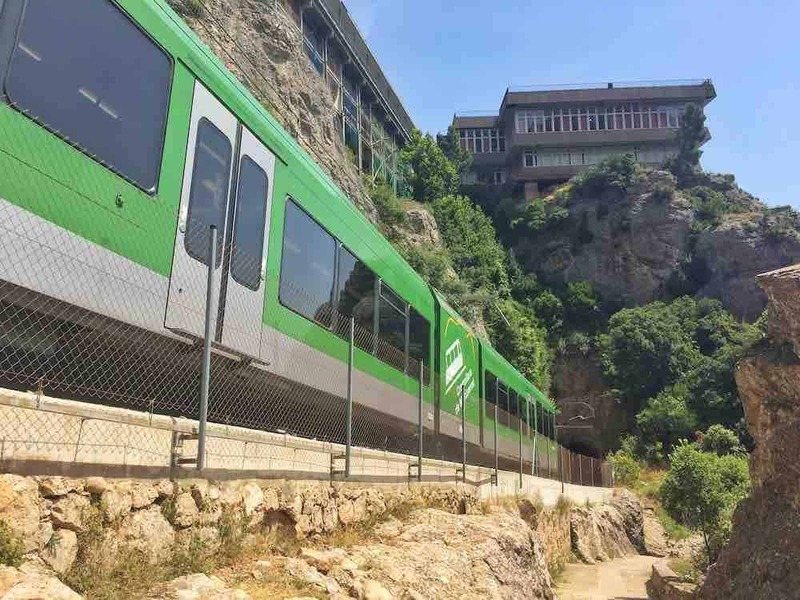 The Montserrat rack railway or cremallera mountain train as it is otherwise known leaves from the second of the Barcelona to Montserrat train stops. It is called Monistrol de Montserrat which is also a town by the same name. The Montserrat rack railway is often incorrectly referred to as a funicular which is confusing. The two Montserrat funiculars are on top of the Montserrat mountain itself and used to access different areas of the Montserrat mountain range. More on those later. There are 3 stops on the Montserrat rack railway, Monistrol de Montserrat, Monistrol Vila and Montserrat. Whilst there are supposedly are some nice views, the only reason you would use the Monistrol Vila stop is if you were getting to Montserrat by car to use the car park there. There is also another carpark right at the top next to Montserrat Monastery. The Montserrat rack railway operates 8:35 to 18:15 in low season and 8:35 to 20:15 in high season. The journey from Monistrol de Montserrat to Montserrat Monastery takes around 20 minutes. If you are going back down Montserrat mountain this way be sure to check the last train time and allow yourself enough time to make your way back down for your Montserrat to Barcelona train.The Montserrat rack railway is fully wheelchair adapted and has accompanying lifts at the stations. 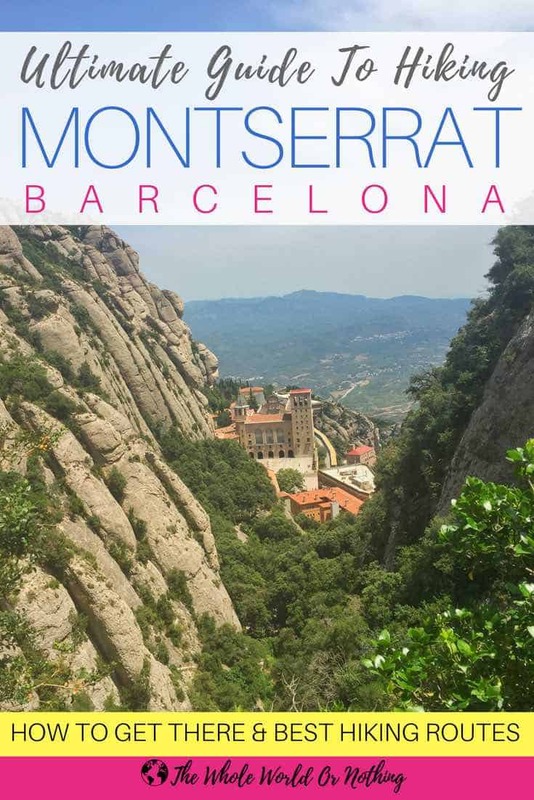 If you change your mind about doing the whole of the Montserrat Barcelona hike, you can purchase tickets separately for the Montserrat rack railway, Montserrat cable car and Montserrat funiculars while on the mountain. This option is naturally more expensive than purchasing a Montserrat combined ticket upfront. However please note they are not interchangeable. So for example, if you choose to visit Montserrat via the Montserrat cable car on the way up, you can’t then come back down on the Montserrat rack railway. 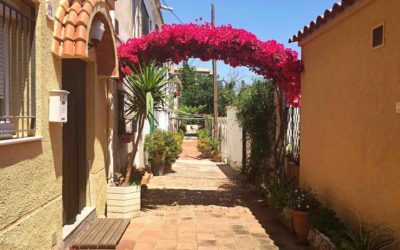 The area around the Montserrat Monastery has been developed into a small village with restaurants, shops, toilets, a museum, a tourist information office, a picnic area and even a farmers market. Hiking maps are available from the tourist office. If you are coming to Montserrat just to hike it is still worth popping into the Montserrat Monastery. Because even if you are not an architecture fan or at all religious, you can’t fail to be wowed by the richness and intricacy of the building design. The full and correct name of the Montserrat Monastery is The Benedictine Monastery Santa Maria de Montserrat. The area has been of religious significance since pre-christian times when Romans first built a temple to worship Venus. Its first written mention was in 888. Later hermit monks built various hermitages and the Montserrat Monastery was founded by development of the hermitage of Santa Maria in 1025. The Montserrat Monastery was rebuilt after largely being destroyed in the Battle of Montserrat in 1811. During the Franco dictatorship, Montserrat Monastery put up resistance to the ban on the Catalan language and culture. Many persecuted Catalans hid out here and more than 20 monks were executed as a consequence, making Montserrat Monastery an important symbol of the Catalans’ fight against government oppression. The Black Madonna or La Moreneta as she is also known, is the Patron saint of Catalonia. Many miracles have been attributed to her over the years. Believed to have been carved in Jerusalem at the beginning of the religion, this is one of the most important Black Madonna statues in the world. The figure is enthroned above the high altar in the basilica of the monastery and many pilgrimages are made every year to visit her. There is no charge but there is a separate queue to the right of the Basilica atrium, you can expect to wait up to 45 minutes at busy times and a donation is appropriate. It is tradition for you to kiss or touch her hand whilst opening out your other hand to Jesus. It’s free to just wonder into the rest of the Montserrat Monastery. The history and art of the Black Madonna is covered in the Montserrat Museum, which costs €7 if you don’t have a TOT Montserrat ticket. The first of the two funiculars you can use on a visit to Montserrat is called Funicular de Sant Joan. It takes you close to the highest point of Montserrat, although a hike is still involved to reach the summit. The other Montserrat funicular is called Funicular de Santa Cova and actually takes you slightly back down Montserrat mountain to the cave chapel known as Santa Cova. 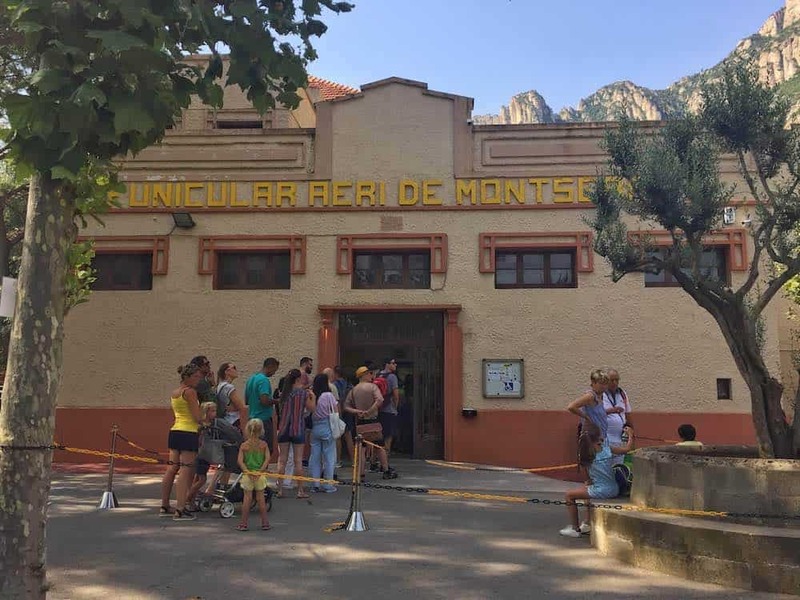 If you haven’t purchased Montserrat combined tickets or a TOT Montserrat ticket, you can still purchase tickets from the funicular stations for both Funicular de Sant Joan and Funicular de Santa Cova. Individually they are costed at €8.45 single or €13 return for Funicular de Sant Joan and €3.40 or €5.20 return for Funicular de Santa Cova. Santa Cova or Holy Grotto as it is otherwise known, is an important religious cave, where legend has it some shepherds saw the Virgin Mary. It is around a 20 minute walk from Santa Cova Funicular which runs every 20 minutes between 10:10 and 17:00 from near Montserrat Monastery. If you are interested in learning about how funiculars work, there is a small exhibition in the Santa Cova Funicular station. You can also just take a picturesque hike directly from the Montserrat Monastery, along one of the Montserrat hiking trails. More on that below. The Sant Joan Funicular Montserrat also starts from near Montserrat Monastery, taking you on a steep journey up the Montserrat mountainside. It runs every 20 minutes between 10:10 and 17:00. From the Sant Joan Funicular Montserrat station you can enjoy views over the whole of Montserrat mountain. 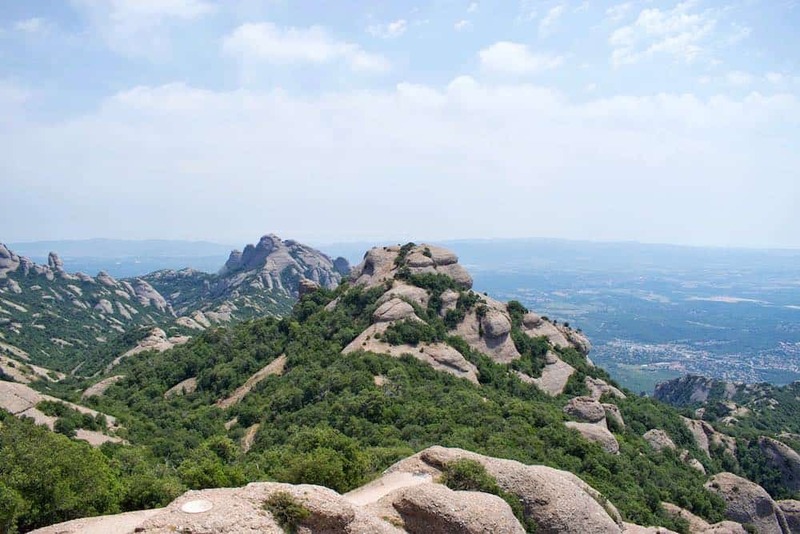 It is also the start of a few of the Montserrat hiking trails including the hike to the the summit of Sant Jeroni. You can also just get here by hiking directly from the Montserrat Monastery. Okay let’s get back into the other Montserrat hiking trails. Once you reach the Montserrat Monastery there are numerous different routes you can take to explore more of the mountain by foot. The Montserrat hiking trails on the mountain are well developed and well marked, quite different to the ones on the way up. Let’s run through the details of the most popular Montserrat trails on the mountain. First up an easy one that you can do in under an hour, the Montserrat Monastery hike to Els Degotalls. This 3.2km length of Montserrat trails should take under 50 minutes to complete there and back. It’s a peaceful walk with lots of time for reflection on mainly flat paths. 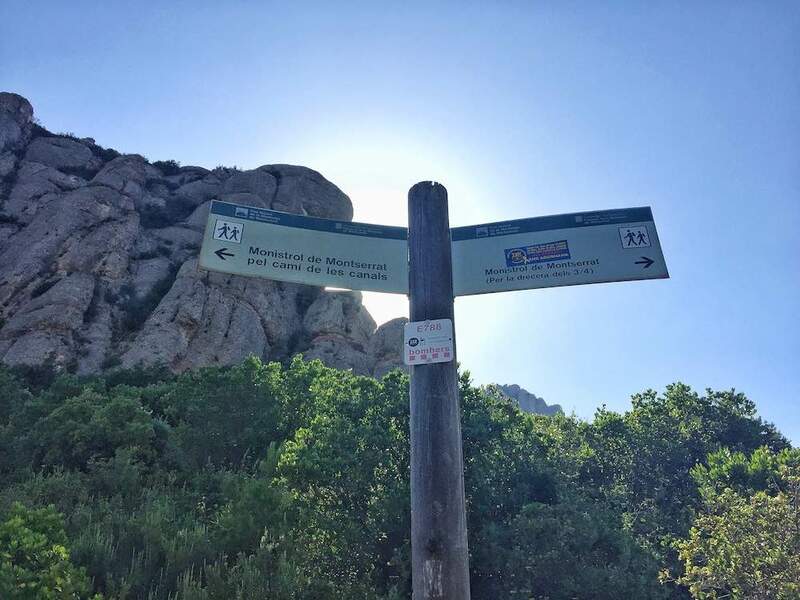 To access this Montserrat hiking trail, head towards the Montserrat Monastery car park and then take the path to the left of the Mirador dels Apostals. At the end of the Cami dels Degotalls hiking route, where you will turn around, you will see the Degotalls rock formation which used to have fresh water running from it. 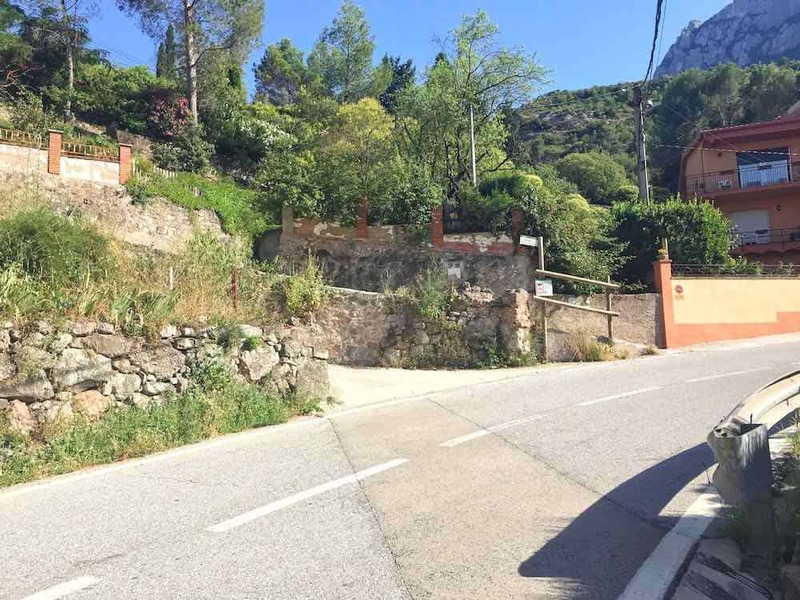 To access the start of this Montserrat Barcelona hike, take the paved path in between the Montserrat cable car and Montserrat rack railway stations. It’s a little steep but will take just 20 minutes to get to the lower station of the Santa Cova Funicular. Then continue along ‘The Path of the Rosary’ flanked by monuments and panoramic views for around 20 minutes until you reach the base of St Paul’s Needle. A further 25 minutes will lead you to the chapel and Santa Cova grotto. The length of the hike there and back is 2.7km and should take around 1 hour 30 minutes in total. You return on the same path but can of course take the Santa Cova funicular back up if you want to avoid the steep incline or are short on time. 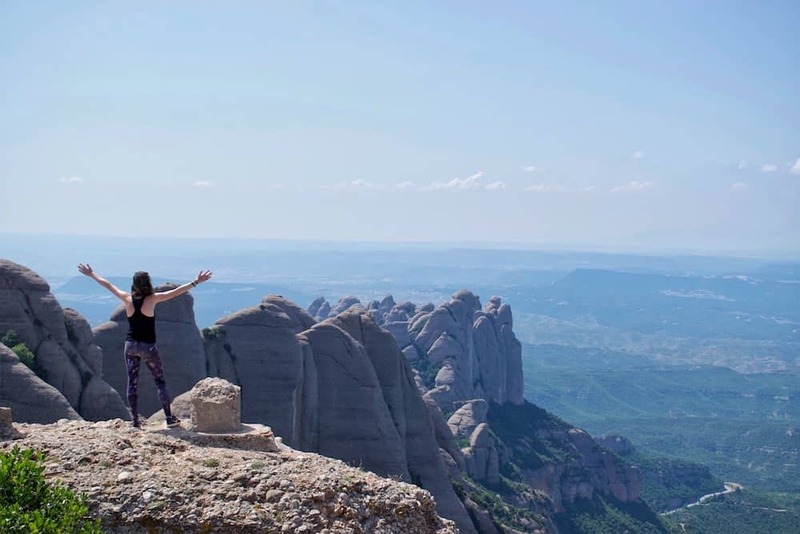 The Montserrat hiking trail up to the San Jeroni summit is by far the most rewarding hike and if you have the time, the one you should choose. It has 360 degree views not only over the whole of the Montserrat mountain range but also over most of Catalonia. It’s insanely good and I don’t believe any photograph will ever do it justice. You simply have to see it to believe it. 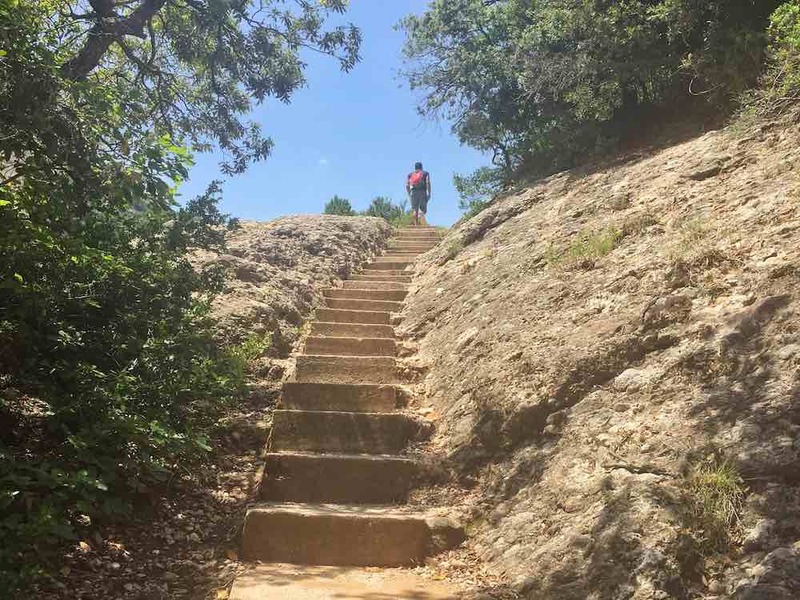 To find the start of this Montserrat hiking trail, walk past the Tourist Information Office with it on your left and follow the signs for Sant Jeroni. Signposts at regular intervals will point the direction and tell you approximately how much further there is to go to the summit. There are some some steep inclines in places and many steps in the final section but it is a mainly paved path through some really pretty forest sections. It took us around 1 hour and 15 minutes to reach the summit. And one of the greatest viewpoints in Barcelona. You’ll want to factor in some time to spend at the top enjoying the views. Then you can either return to the Montserrat Monastery the same way or take a slightly longer route. We did this and it took us the same amount of time (1 hour 15 minutes) as obviously we were going downhill this time so it was a little easier. 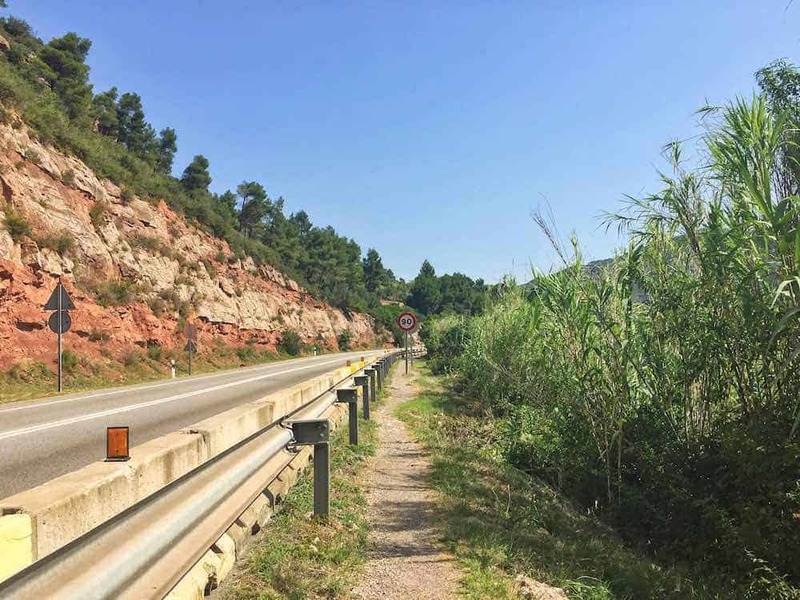 On your way up you will notice a sharp incline through some woodland that leads to a paved path T junction where there is a signpost marked ‘Pla dels Ocells’. 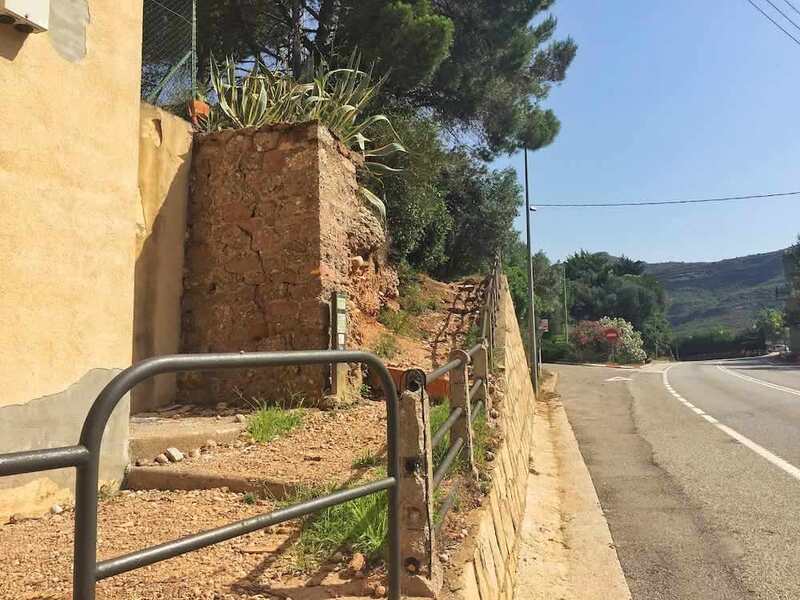 You will take the right to continue up to Sant Jeroni summit. But on your way back down, this is where you need to carry on straight forward instead of turning left down through the woodland. After around half an hour downhill, you will come to the upper station of the Sant Joan funicular. There are some toilets here. Walk past and straight forward up a wide paved path marked Pas dels Francesos and Monestir de Montserrat. Then keep descending all the way down to Montserrat Monastery. There are so many more epic viewpoints for you to stop and give your knees a rest at. Total hike time back to Montserrat Monastery is 2 hour 30mins. 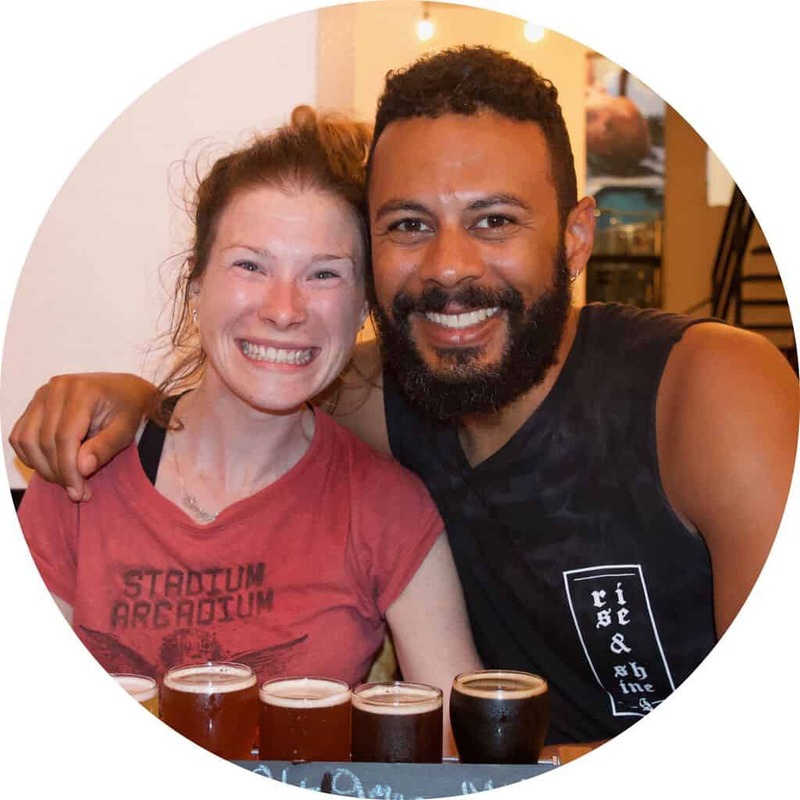 It was a really hot day in late July when we did our Montserrat mountain hike and we each took two 1.5L bottles with us, refilling them and drinking over 4 litres each during the hike. 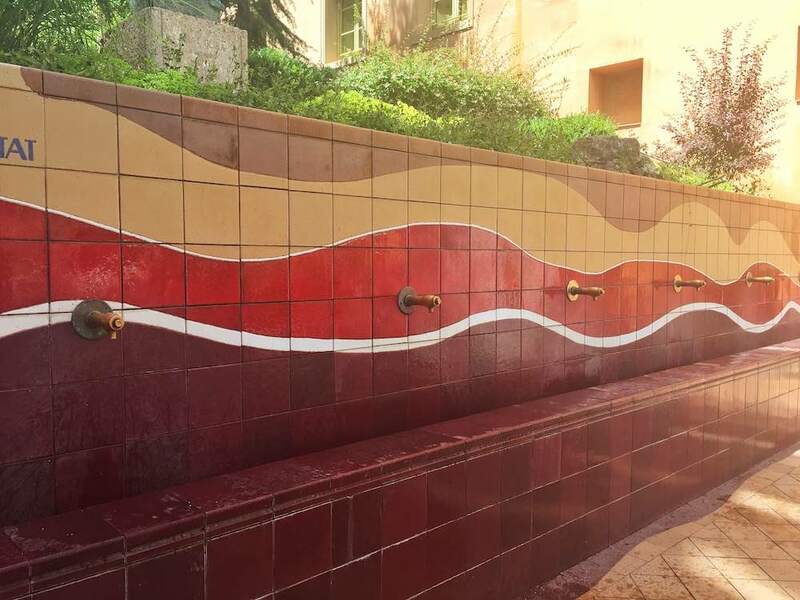 There is only one water fountain point and it is near the start of the Montserrat hiking trails to Sant Jeroni. You can also buy water from the shops near the Montserrat Monastery, but as with everything up there it’s pricey. To keep your costs low, and also because even though we didn’t eat in the restaurants the food seemed very overpriced for what it was, our advice for your Montserrat visit is to take your own picnic. You can freeze your water bottles to keep your food chilled. Although disappointingly it isn’t shaded, there is a nice picnic area near the Montserrat Monastery where you can stop for lunch. If you have the option, it is best to visit Montserrat during the week as in general everything is less busy. Especially to cut down on queuing times if you do choose to use the Montserrat cable car or funicular systems. Also be extra careful with your belongings at Plaça Espanya in Barcelona. 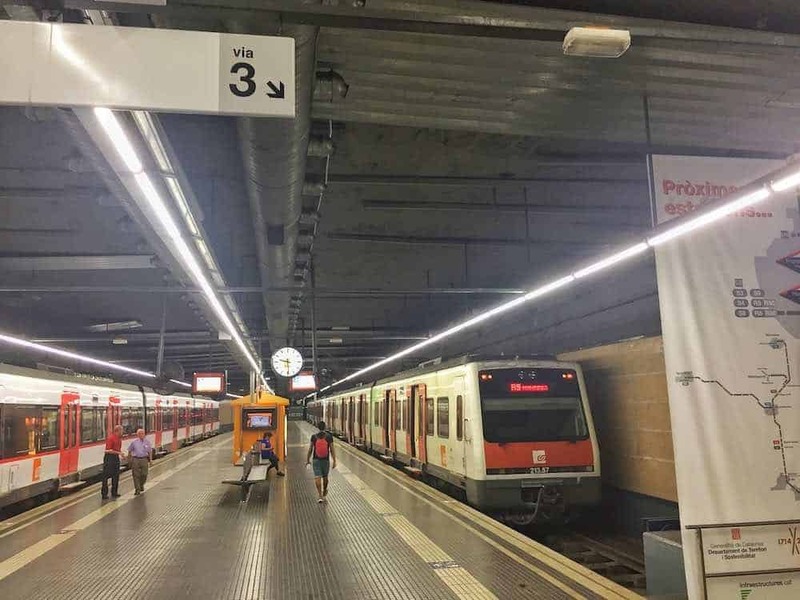 It’s a busy train station and an ideal place for pickpockets to target confused tourists looking for the correct platform to find the Barcelona to Montserrat train. If you plan to do the full Montserrat Barcelona hike from the bottom right up to the summit and back, as we did, we recommend taking the first Barcelona to Montserrat train to allow yourself plenty of exploring time without worrying about missing the last train back. When you’re following the Monserrat Barcelona hike signposts just watch out for the fact that Monistrol de Montserrat. i.e. Monistrol village, is very similar to Monastir de Montserrat, i.e. Montserrat Monastery and that they are obviously in different directions. Don’t get the two mixed up. 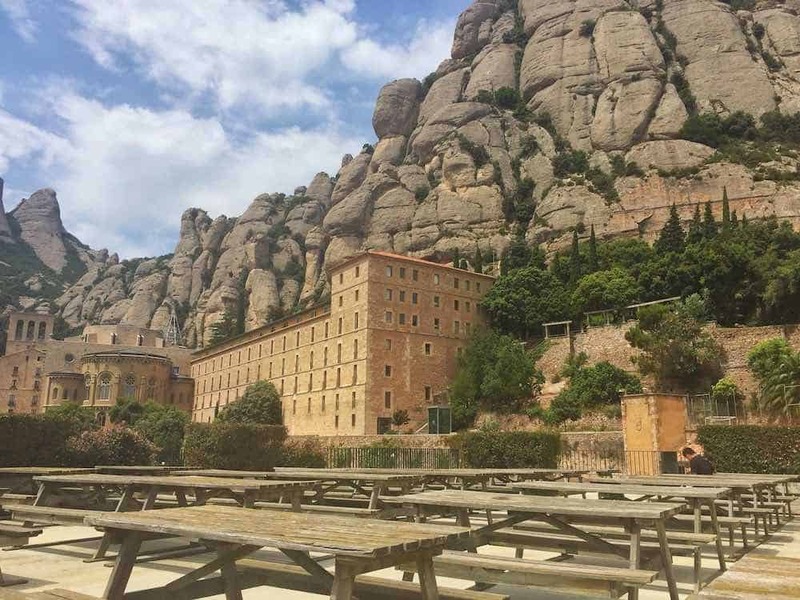 If you fancy visiting Montserrat on more than a one day trip from Barcelona, perhaps to explore more of the Montserrat hiking trails, there are a few Montserrat accommodation options. 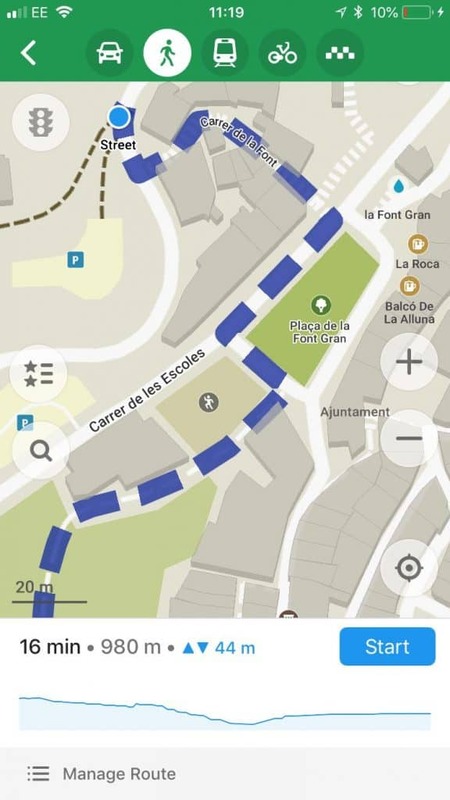 You can stay at either the Montserrat Monastery Hotel (Hotel Abat Cisneros) or in the apartments next to the Montserrat Monastery (Abat Marcet Apartments). There is often a 2 night minimum stay during peak times, you can check prices on the Montserrat website. 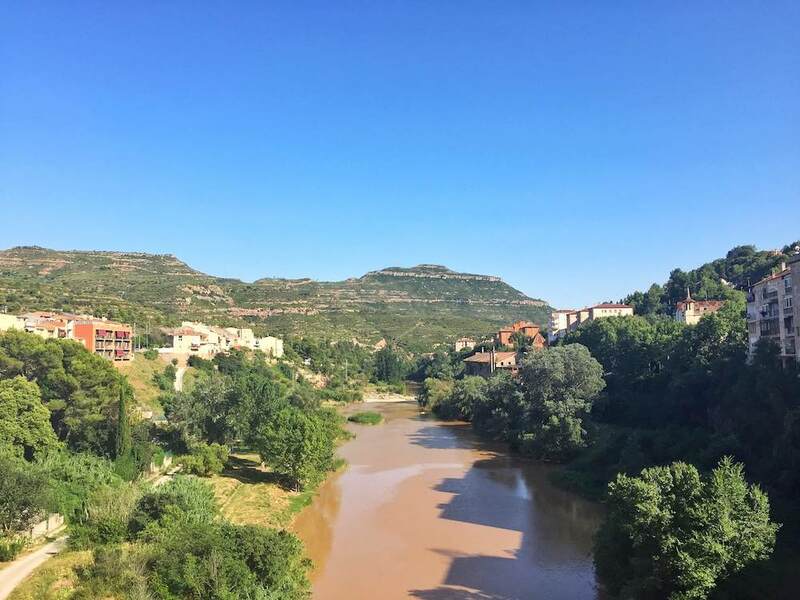 For cheaper alternatives, there are camping facilities from €5.60 per night, or you can search for accomodation in the village of Monistrol de Montserrat. 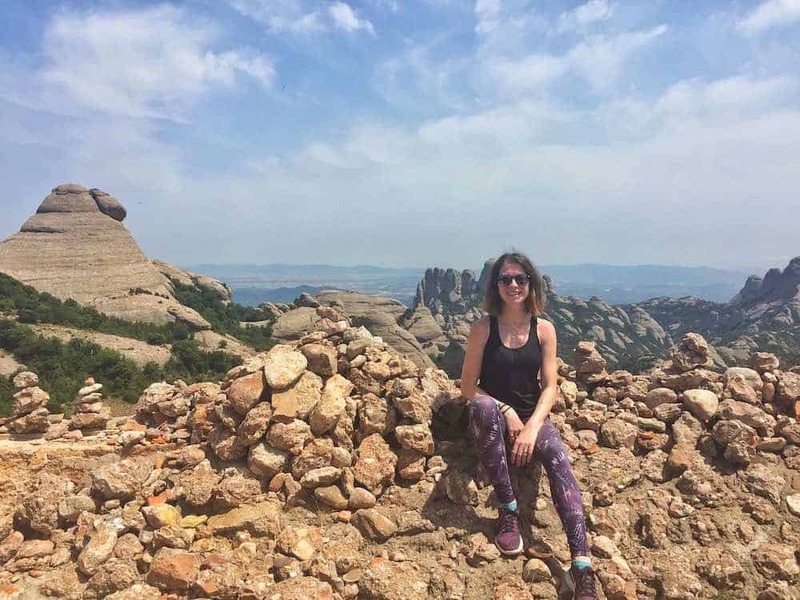 If you have any further information to add from your own Montserrat Barcelona Hike, have any questions, or have time to tell us whether you found our information on Montserrat useful so we can write more articles like this, please leave a comment below. 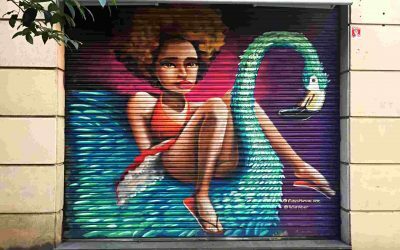 You may also find our information on Barcelona itinerary planning, Barcelona travel tips and recommendations on the best place to stay in Barcelona helpful. Thank you so much! I’ve been looking for this for days.. Well put out as well. 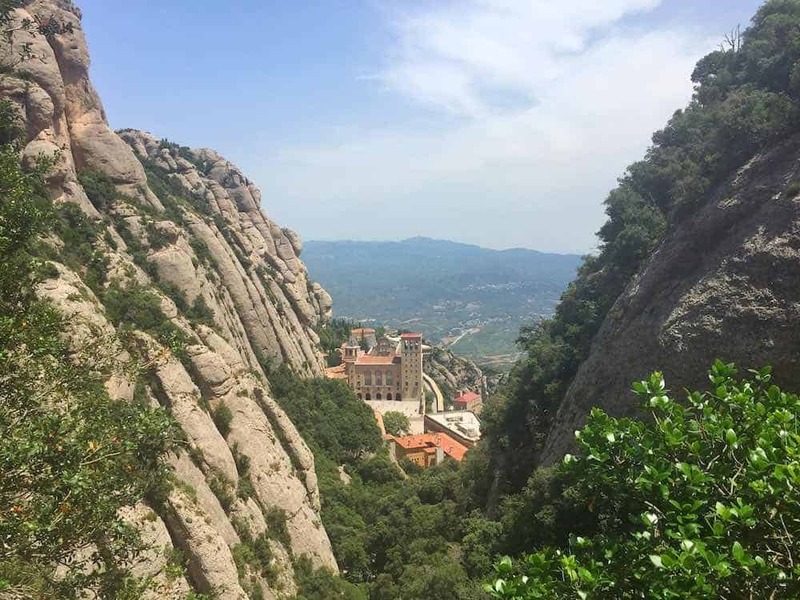 I have a quick question.. Is it risky to plan to take the first train, do the hike up to the monastery and spend an hour there, then do the San Jeroni hike then back to Monistrol de Montserrat? Does it give enough time to catch the last train or am I winging it? Thanks a ton, again! So glad it’s helpful for you! You’ll be completely fine with that itinerary. Ask at the tourist info desk before you head off on the San Jeroni bit what time the last train is for that day, then you’ll know exactly how much time you have to play with. Have an awesome time! It’s such a beautiful hike. You are so welcome Raquel! Hope you had the best time. We love it up there. We met some climbers up there, there are a lot of nice routes for them too. And in general if you like to get in contact with people, at least have a chat with them on the decent together! Hey Oliver, so happy the info helped 🙂 And agreed, it’s nice to have a chat with the people you meet on the way, plenty of different kinds of people visiting for all manner of different activities. Glad you enjoyed it! A very interesting guide. Thanks a lot! But one question further: do you know if there are any extended hiking routes starting from the Monastery? Or is it just a one day trip? Thanks! Hey Boris, as far as we’re aware there are various routes you can take from the monastery but they’re just ones you can complete within the day. We didn’t see any info on extending the hikes further unfortunately.